This unique invitation is made to look like a vintage old hollywood movie ticket or theatre ticket with an art deco theme. Printed on a very thick 110lb metallic gold cover stock and with a tear-away RSVP, this invitation is bound to leave your wedding guests stunned and thrilled for the wedding of a lifetime. 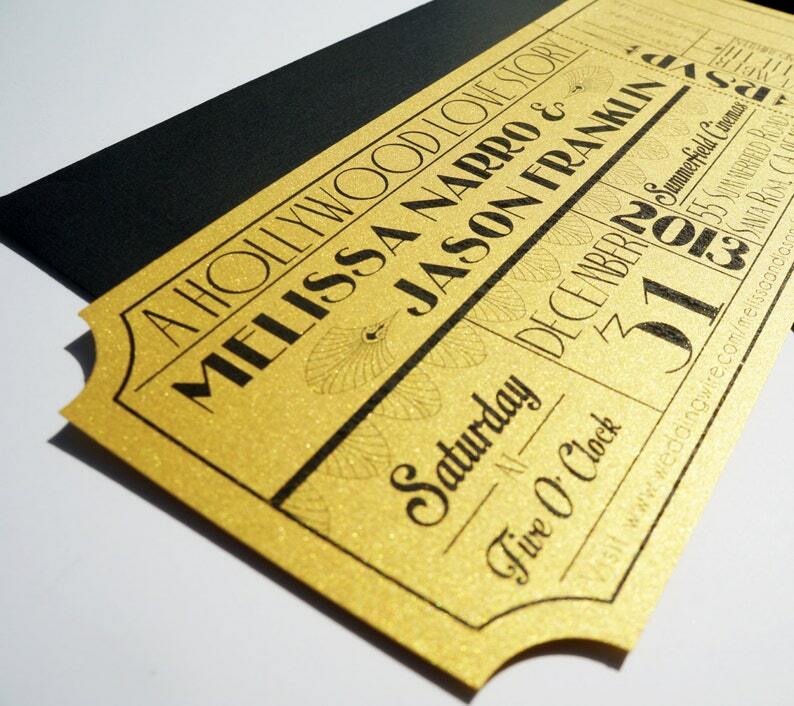 This invitation is a high quality print on super thick 110lb metallic gold cover stock. Each invitation set is priced at $4.00 each. There is a minimum purchase of 25 invitations. You may purchase your invitation amount directly from this listing. After the purchase is complete, I will send you a message with all the pertinent information needed (wording, color options, etc). Once the proof is approved, the printing and construction of your invitation will begin. This can take anywhere from 2-4 weeks. Invitations can be rushed at an additional cost if needed. The invitations look AMAZING, we could not be any happier! Guests are just starting to receive them and everyone is blown away with how perfect they are. Thank you so much!!!! I absolutely LOVE my invitations! I have gotten so many compliments. I needed a quick turn around and Britt was very patient with me and made sure I got them when I needed. Thank you so much Britt!! I will definitely be ordering from you again!! Loved working with Britt to design my invitations! She made our vision come to life and keep our old-hollywood theme throughout all aspects of our wedding. This invite was a dream come true. Britt was very helpful and the whole proofing process was super easy. I'm so in love with them that I don't want to mail them. Great quality! Beautiful invitations!